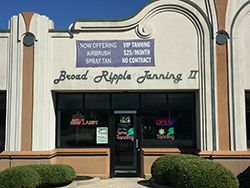 Broad Ripple Tans welcomes you! We are a locally-owned and operated tanning salon in Indianapolis, located west of Evanston Avenue, and just down the street from Broad Ripple Village. Our neighborhood tanning salon offers a relaxed, calming, and indulgent tanning experience that pampers customers with sparkling clean tanning beds, fresh laundered towels, complimentary sweet treats, friendly customer support, and an array of professional services and products. We provide an assortment of UV tanning and sunless tanning options, including regular beds, super beds, mega beds, stand up beds, and spray tans, all at the most competitive prices in town! Call us today at 317-257-8262 for details about our tanning services and products. Our staff members are highly trained tanning technicians that are well-versed in the industry, and gladly educate our customers on how to tan safely without sacrificing quality or effectiveness. We ensure that all our clients reach their complexion goals by expertly customizing the right combination of tanning product, tanning bed and tanning course, for each client’s individual skin type and tanning needs. We have a wide selection of top-of-the-line tanning lotions and skin care products, such as Norvell Skin Solutions, Australian Gold; and various tanning accessories, including exfoliating mitts, eye protectors, lip balm, and more! We have everything you need to tan comfortably and get the results you are looking for! Sparkling Clean Beds and Salon, ALWAYS! AMAZING Tanning Coupons and Deals All Year Long! Bulbs Replaced at 50% Power - New Lamp Tanning Every Time! Open Late During the Week! Ask About Our STUDENT DISCOUNTS & VIP TANNING PACKAGES!